← I gather that I’m supposed to catch all of these. 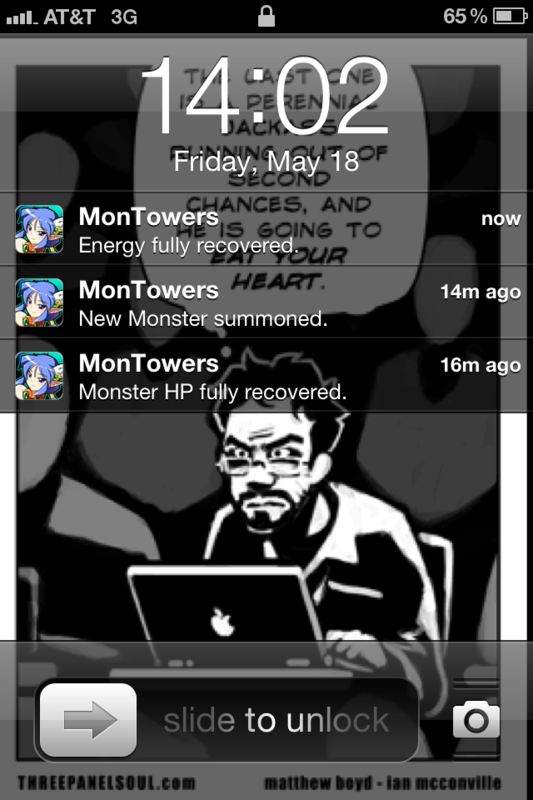 I’ve been really enjoying Montowers, the game I mentioned last week, despite some minor frustrations. The monsters I’m taming and summoning are starting to take over 2 hours to summon, now, and I’m having to do a lot more resource gathering to summon and level them. At the same time, I’m having some pretty tough fights if I fall behind the curve. My background, by the way, is from this most excellent Three Panel Soul strip, part of a short series of comics where I felt like they’d installed cameras in my house to watch my life. Part of what’s kept me hooked on Montowers, to return to the topic of this, is that it’s really well suited to a mobile phone game – you can start it up, play for 1 or 2 minutes, and feel like you’ve accomplished something. I’m even still enjoying the collect-them-all style of play, though I was a little disappointed when I started getting some monsters from the nastier bits of the monster manual and realized that they don’t have any attacks that are really tailored to them. I had a cockatrice for a while, for instance, and he didn’t have any sort of stun attack to simulate turning an enemy to stone. That sort of thing. I don’t know if it has a proper ending. I know that there are a finite number of towers, and that each has a finite ending, so theoretically I should stop once I clear that last tower – if I make it that far. I do know that I’m not going to actually try to collect them ALL, as “rare” creatures can take hundreds of fights before you actually catch them, and towers bosses are worst of all. Maybe I’ll try to collect all the “common” and “uncommon” monsters and call it good. A few days ago, while I was trying to finish up Fantasy Defense, I was fighting off a particularly nasty – and scantily clad – demoness. In order to upgrade some units that were closer to the enemy in question, I had to take a few units that were further away and sell them. To her credit, she didn’t even try to throttle me. This entry was posted in iOS, Webcomics. Bookmark the permalink.